This week I continue with “numismatic curiosities,” some well known and some obscure. 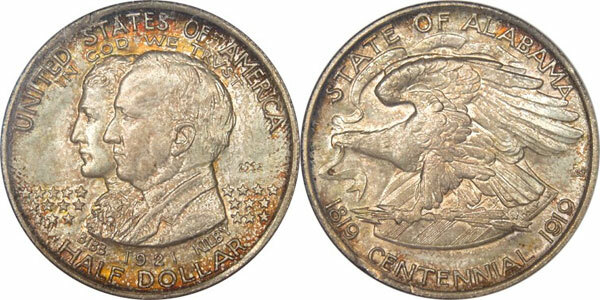 The centennial of Alabama statehood took place in 1919, but half dollars commemorating the occasion were not issued until 1921 (better late than never!). “Liberty” is often portrayed as a goddess or other woman on United States coins, but when asked, noted sculptor Augustus Saint-Gaudens once said that his ideal depiction of liberty would be a young boy leaping. Was the silver half disme of 1792 a pattern or is it a regular issue? The debate was given at length in Harold P. Newlin’s 1883 monograph on half dimes (he said it was a regular coin). Today, nearly everyone agrees. Confusing? 1974-dated aluminum Lincoln cents were struck in 1973. 1964-D Peace silver dollars were struck in 1965. The Charlotte Mint building, now removed to a city park, still stands and is used as a museum in that North Carolina city. The Dahlonega (Georgia) Mint burned down in the last century, but its foundation still exists, now supporting another building. Much print has been expended on what is the most beautiful American coin — the 1879 Schoolgirl pattern dollar, the MCMVII Saint-Gaudens High Relief $20, the 1916 Liberty Walking half dollar, or pick your favorite. The ugliest design is not often considered, but one 19th-century observer of the numismatic scene considered it to be a pattern silver three-cent piece made in 1849, with just the number 3 on one side and the Roman numeral III on the other. My vote for ugliest goes to poor Jefferson and the way he looks on current nickels. They went from a fine depiction from 1938-2004, then in 2005 made a unique obverse that is by far my favorite of all, then in 2006…yuck.